In October 2015 The Nature Conservancy Australia and Kilter Rural launched the Murray-Darling Basin Balanced Water Fund to provide water security for Australian farming families while protecting culturally significant wetlands that support threatened species. The Fund invests in permanent water rights in the Southern Murray-Darling Basin and allocates those rights in a smart way. When water is scarce and agricultural demand is higher, more water is made available to agriculture. When water is abundant and agricultural demand is lower, more water is allocated to wetlands. It is a win-win, aligning the interests of people and nature. 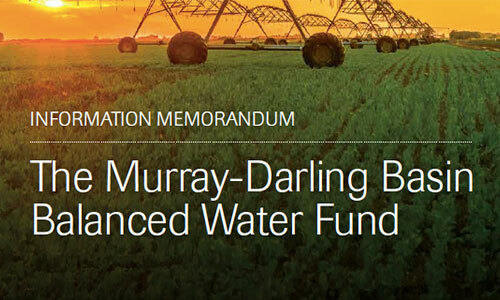 Operating in the world’s largest water market, the Murray-Darling Basin Balanced Water Fund is the first water investment fund in Australia to address balanced environmental, agricultural, social and financial outcomes. The Fund’s water portfolio is managed by Kilter Rural, one of Australia’s largest water fund managers with over $190 million of water assets under management. Supported the ongoing development of high value irrigated agriculture. The Trustee now seeks to make a follow on offer for the purpose of raising additional capital for the Fund. In connection with this offer the Trustee has issued an updated Information Memorandum dated 25 October 2017. Enter your email address below to receive a link to download the Information Memorandum. Enter your phone number if you would like one of the team to contact you.